Indian folk music goes global, thanks to Bhojpuri singing sensation of Assamese origin, Kalapana Patowary with the launch of her new album The Legacy of Bhikhari Thakur. Produced by EMI/Virgin records, the album is a tribute to noted Bhojpuri litterateur Bhikhari Thakur. It was launched in Mauritius on the 4th of June 2012, by the country's Vice Prime Minister and Minister of Public Infrastructure Mr. Anil Kumar Bachoo and Mr. Mookhesswur Choonee. The richness of Bhojpuri mores have perhaps been shadowed by the massive popularity of double meaning hip shakers, thanks to the competitive rating points driven entertainment industry. It therefore comes as a surprise when one of the most popular Bhojpuri vocalists decides to stream aside from the rat race and explore the lost works of Bhikhari Thakur, fondly known as Shakespeare of Bhojpuri literature for his contribution to poetry and drama. Assam born singer Kaplana Patowary has carved a mighty niche for herself in the entertainment industry having lent her vocals to a numerous Bhojpuri songs as well as Bollywood numbers including films like Billo Barber and De Dhana Dhan. Although she has a myriad of folk and popular songs to her credit, Bhojpuri music has been her most dedicated foray. Born in 1887, Bhikhari Thakur’s creative sojourn began late in his life for he was an illiterate until quite a few decades of his life. He learnt the three Rs from a shopkeeper when he went to Calcutta following a family tradition of working in the city. The stark social and cultural variations of his village and Calcutta, as well as works of Raja Ram Mohan Roy inspired him to express his experiences through literature. On returning to his village Bhikhari Thakur formed Bhikhari Thakur Natak Mandali thus creating a theatre form called Bidesia. Unlike conventional poets and dramatists, Thakur’s work took a dig at the redundant ways and customs of the society of his. One of his most noted works includes the tale of a woman in a village whose husband leaves the village to work in a but she still has physical desires, so she gets involved with another man and has a child. Inspired by the contemporary nature of Thakur’s writings, Kalpana felt a need to share his work with a present day global audience. It turned out to be a mammoth task as the material available on Bhikhari Thakur is negligible. Luckily her rendezvous with a 98 year old dancer from the Bhikhari Thakur Natak Mandali gave her a first person account of the experiences of Tahkur’s legend as well as well walked her through his works. 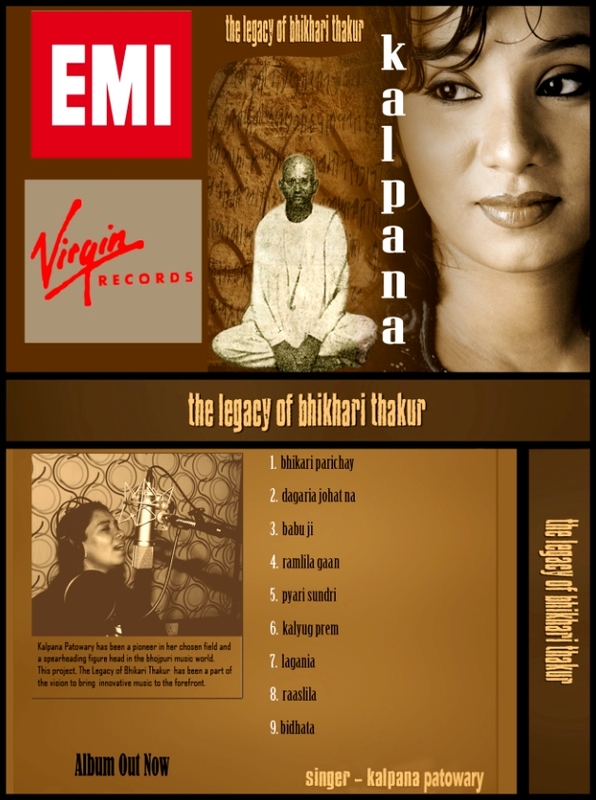 Titled The Legacy of Bhikhari Thakur, Kalpana’s tribute to the Shakespeare of Bhojpuri literature has nine melodious tracks, the lyrics of which were penned down by Thakur himself. His memorable poems on immigration and unemployment rendered by Kapalana's powerhouse vocals have been welcomed with warmth in many parts of the globe. It has been launched in France and Mauritius and a launch in is scheduled in the foreseeable future. It's comes as no surprise that EMI/Virgin Records has undertaken the risk of pricing this Bhojpuri album at Rs. 195. The Legacy of Bhikari Thakur takes Bhojpuri music from the masses to the classes. Heard the tracks...."Magnificent . . . Good traditional music, an angelic voice and a perfect sound." Do not Spam. Stay on topic. Do not post anything defamatory, harmful, abusive, racially objectionable, or otherwise illegal. If you violate these rules, your post will be deleted.